The Tel Hai community sends heart-felt congratulations to our alumnus LAHAV SHANI on being appointed the Music Director of the Israel Philharmonic Orchestra. We are hugely proud of Lahav's achievements and wish him, a successor to the legendary Maestro Zubin Mehta, tremendous artistic triumphs! Tel-Hai Master Classes are proud to announce that Nimrod David Pfeffer, our former participant, has won the third prize in the Maestro Solti International Conducting Competition in Hungary. Nimrod will also be conducting the Israeli Opera pruduction of Mozart's "Don Giovanni" in February 2018, replacing Daniel Oren. With our dear Mentor and Senior Faculty Member Professor Dmitri BASHKIROV we mourn the loss of his beloved wife, Natalia Alexandrovna. On Tuesday, 15.8.17, Tel Hai International Piano Masterclasses presented a special concert for the members of “Ruakh Midbar”, the nearby rehabilitational facility for drugs- and alcohol-addicts. Such concerts are becoming an annual tradition, this being the third concert dedicated to the “Ruakh Midbar” people. The event took place in the Interdisciplinary Center at the Midreshet Ben Gurion campus. Two chamber-music ensembles with the residing Masterclasses instructors, violinist Vera Vaidman and cellist Diana Cahanescu, including the students Eunbi Song and Meshi Ohana, joined four piano duos: the twin sisters Clara and Marie Becker of Germany, Olga and Ksenia Kemova of Russia, Bartos Kaolaczewski and Wojciech Szymczewski of Poland, and Igor Sedyuk and Oleg Kopelyuk of Ukraine. The atmosphere was moving from the first moment, and the audience proved extremely attentive during the entire eighty-minute event. The warm and human responses from the audience brought the organizers and performers to a new sensation of involvement. The give-and-take between the performers and listeners was a unique experience. Musical offerings included the classical Haydn (trio) and turbulent Schumann (the violin sonata in A minor), the familiar folk music of Brahms Hungarian dances no. 1, 2 & 5, the ever popular Waltzes from the ballets by Tchaikovsky, enchanting Children Games by Bizet, concluding with the jazzy Gershwin Prelude no. 3 (Marie and Clara) and the composer’s “I Got Rhythm” – played by Yoni Farhi -- all of which met with keen curiosity and enthusiasm of the audience. The noon concert left performers with the sense of delivery and hope that some help – little as it may be – had been provided in the healing process of the listeners. We thank Dana Meir for bringing the special and engaging group of "Ruakh Midbar" to us, and look forward to the continuing this important project next year. We are very happy to announce that our co-recipient of the Pnina Salzman Memorial Prize for excellence at the 2017 classes, Ji Young Kim from South Korea (student of our faculty, Aviram Reichert), just won Third Prize at The 4th Maj Lind International Piano Competition in Helsinki, Finland (Dmitri Bashkirov was the Chairman of the Jury). Warm congratulations from all of us in the Tel Hai International Piano Master Classes! Warm congratulations to Yevgeny Yontov, our frequent attendee, on reaching the final round of the Arthur Rubinstein International Piano Master Competition, winning the Best Chamber Music Performance award, and sharing the 4th - 6th ex aequo prizes. Every success, Yevgeny! Congratulations to Kemova Sisters Piano Duo upon winning the Second Prize at London Grand Prize Virtuoso Competition 2017, Mixed chamber music category. 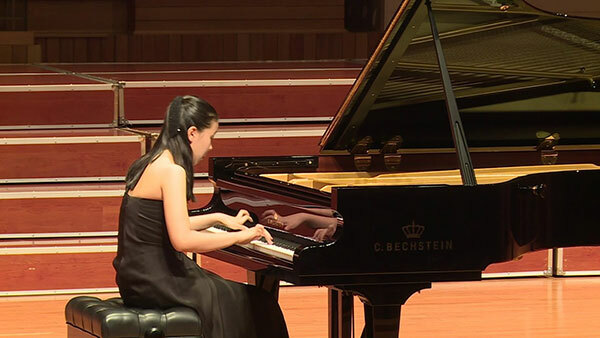 Warm congratulations and best wishes to Yoon Jeong Hyun, Tel-Hai participant in 2015 and winner of that year's Jasha Bistritzky Concerto Competition at Sde Boker, upon just being awarded the Second Prize in the Hong Kong International Piano Competition! We congratulate Prof. Aviram Reichert, our faculty member, on this lustrous recognition of his student. Tel-Hai Master Classes warmly congratulate Su-Ah Ye, our participant from South Korea, a recipient of the Pnina Salzman Memorial Prize for excellence at the 2016 classes, and her professor, Aviram Reichert, a member of our faculty, on Su-Ah's winning the FIRST PRIZE in the Arthur Rubinstein International Youth Piano Competition in Beijing.